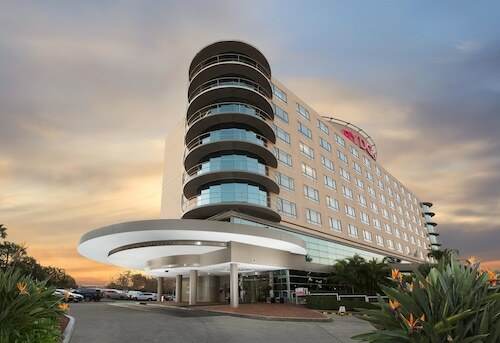 Located in the heart of The Rocks, this luxury hotel is steps from Museum of Contemporary Art, Circular Quay, and The Rocks Markets. 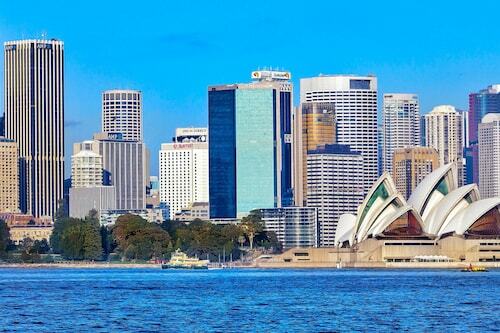 Overseas Passenger Terminal and Sydney Observatory are also within 10 minutes. Wynyard Station is 9 minutes by foot and Sydney Circular Quay Station is 6 minutes. 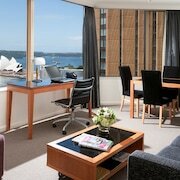 Stay in our Circular Quay and The Rocks hotels and explore this historic area of central Sydney. The Rocks was the site of the first European settlement in Australia in 1788. Originally home to local Indigenous people, the Cadigal, the area became a convict town and then transformed into a busy port city by the mid 19th century. The Rocks and Circular Quay area offers numerous restaurants, cafes, pubs, art galleries, museums and historic landmarks. The Rocks is a great place to shop as historic pubs and cottages are occupied by retailers selling everything from designer clothes to antiques, souvenirs and traditional boiled sweets and every weekend over 150 stalls fill the northern end of George Street for The Rocks Markets. The Sydney Harbour Bridge is one of the city's, and the country's, most iconic landmarks. Visitors can learn about the history of the bridge in the museum in the south eastern pylon, which also has a great lookout. But for the more adventurous, Bridgelimb runs supervised climbs of the bridge. 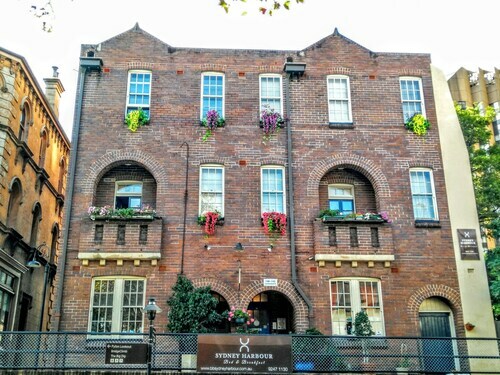 Step back in time, while staying in our Circular Quay and The Rocks accommodation, by visiting the area's numerous historical sites and museums. Learn about the history of The Rocks area from the time when it was inhabited by the Cadigal Aboriginal people, through early European settlement to the present day, at the Rocks Discovery Museum. Visit Sydney CBD's oldest surviving cottage, Cadman's Cottage, which was built in 1816 and home to a convict. Visit the site of Sydney's first battery, Dawes Point Park, and discover original features like the officers' quarters, gun battery and cannon. Experience how working-class families lived in The Rocks in the 19th century by visiting Susannah Place Museum. Other must-see attractions include: The Museum of Contemporary Art; Sydney's oldest pubs including the Fortune of War, Hero of Waterloo, Lord Nelson and the Orient; and the Sydney Observatory, which was built in1858 houses and now houses an interactive museum. For more accommodation options nearby, view our range of Darling Harbour or Sydney CDB hotels, which include family-friendly, two-bedroom and three-bedroom apartments. How Much is a Hotel Room in The Rocks? 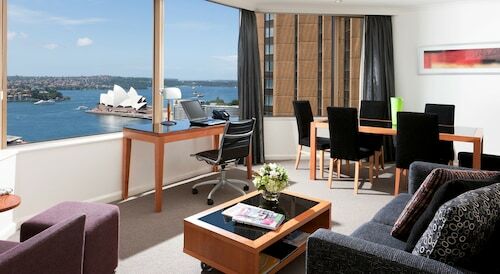 Hotels in The Rocks start at AU$81 per night. Prices and availability subject to change. Additional terms may apply. We loved the: 1. Early unplanned check in 2. Hotel room and comfortable bed. Great natural light in room 3. Brilliant location. 4. Check in staff very professional. 5. Room service dining very good. We were disappointed in: 1. No bar facility open after 9pm because staff said it was a “public holiday period”. We had to go to the Four Seasons hotel bar after the ballet and plays we saw at the Opera House over the Easter weekend 2. Hotel room cleaning not very good and one day missed altogether 2. Walkways on our floor not vacuumed over the Easter long weekend.